Other jobs: In the Brighton Permaculture Trust management team, Stanmer group, including Plot- value adder to the -:- Scrumping Project and all round Peasant. The permaculture principle I need to remind myself of is never have one element supporting a critical function. The principle that keeps popping up in the most unlikely places is “placement” and the importance of beneficial connections. Signing my son up with a temping agency as he hadn’t got qualifications above AS level. Therefore, was not getting in on his CV alone to get an interview. Agencies pretty much give everyone who is of legal working age a chance to do all sorts of jobs. This gave my son a chance to shine and be taken on, through his own merit. He had filled in 30 application forms before that, without one response. Another example is cooking for three different fields at a festival. This brought groups together who would not usually meet; giving them all the permaculture food experience. It was placement and edge all in one. And opened eyes and doors to whole new worlds. Putting energy and effort in at good strategic moments can make something really prosper. My heroes are Aranya Gardens- because he is just such a lovely example of living a better life and bringing people in. Bill Mollison for giving me his humour, vision and his principles. -:- Bryn Thomas for daring to dream of an orchard city. Best example of Permaculture in action close to home is my chicken composter (not what it sounds like). My chickens compost all our green waste and make fantastic poop enriched soil and delicious eggs- they are also great company. I am attending a new -:- series of short participatory workshops run by the irrepressible Dr Charlie Brennan, who has left Australia to come and share over 30 years of Permaculture learning with other countries. His major focus is in community group engagement and municipal permaculture gardens- how to lift the personal blocks and make things happen. 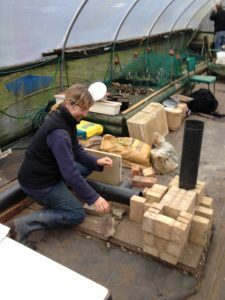 He is off to speak at the International Permaculture Convention in India in early November, so we are very lucky to have a pre-taster before he goes. We have made the events ultra affordable to really open up to folks- places are limited, but we have a few spaces left on the workshops so -:- check out the details on our website why not book on and join me?